A study that will be published in the April 2017 American Journal of Ophthalmology suggests parental pesticide exposure before or during pregnancy may play a role in the development of retinoblastoma. Researchers found using products to kill insects during pregnancy, and up to 1 month before, led to a 2.8-fold higher risk of nonhereditary, unilateral retinoblastoma in children. Retinoblastoma is the most common intraocular childhood cancer. Each year it affects approximately 300 children in the United States and 8,000 worldwide. Even with cure rates of 99% in the developed world, 70% of children continue to die of retinoblastoma in less developed countries. There is a hereditary link in about 40% of cases. The risk factors for sporadic retinoblastoma remain largely unknown. The results of this new study dovetail with a study published in 2013. Researchers found some indication of elevated retinoblastoma risk associated with paternal pesticide exposure in the workplace during the 10 years prior to conception. The latest study focused on maternal exposure to pesticides. Researchers conducted detailed telephone interviews with the mothers of retinoblastoma patients. The study included 282 cases (186 unilateral and 96 bilateral) from the Children’s Oncology Group. Researchers analyzed retinoblastoma risk using healthy, age-matched controls. The study found using both household pesticide products, such as Raid, and professional lawn or landscaping services, were similarly correlated with an elevated risk of retinoblastoma. Home weed killer products were also associated with higher risk, but the results were not statistically significant. Dr. Renelle Pointdujour Lim analyzed the study. There were limits to the study. It used a relatively small sample size. There was also an issue with “recall bias,” because researchers had to rely on the memories of the subjects they interviewed. In general, “Retrospectively collected exposure data introduces the possibility of recall bias; therefore, results should be interpreted cautiously until additional studies are conducted,” researchers said. While current research is far from conclusive, there is certainly enough evidence to raise red flags. It is reasonable to assume that parents should be careful about pesticide exposure during pregnancy, or if they are planning to get pregnant in the near future. “I am sure pesticide use is the cause of many health problems. All of us should be more aware of what we introduce into our environment” said Dr. Paul Finger of The New York Eye Cancer Center. Photo by Michelle Tribe via Flickr. There’s a new way to support the work of The Eye Cancer Foundation. The ECF has partnered with Pledgeling, a platform that facilitates giving to nonprofits. Visitors to pledgeling.com/home can search for specific non-profit organizations or general categories they want to support. For instance, searching for “eye cancer” will bring up The Eye Cancer Foundation. They can donate directly from that page. But Pledgeling is more than just a stop on the Internet to drop off a donation. It is a fully integrated platform allowing businesses to support charitable giving. Pledgeling’s goal is, “Powering the revolution for good.” The organization has helped to raise over $1 million for thousands of charities since its founding in 2014. If you own a business, you can get involved and help support important ECF projects such as our 2020 Campaign to strategically train and place eye cancer specialists in unserved regions around the world. Pledgeling works with Evite Donations to create a platform that allows you set up giving campaigns associated with your next party or function, thereby benefitting The Eye Cancer Foundation. “The combination of Evite’s scale with Pledgeling’s charitable giving platform has made it possible to turn any face-to-face gathering into a moment of positive social impact,” Evite CEO Victor Cho said. You can “do good,” by helping the mission of The Eye Cancer Foundation by utilizing Pledgeling to create a campaign. For more information on how your business can partner with the ECF through Pledgeling, click here. Comprehensive metastatic screening in patients diagnosed with choroidal melanoma is extremely important. Patients at the New York Eye Cancer Center have access to all screening technology commercially available. For example, PET/CT screening was first investigated at NYECC. It is the only method that surveys the entire body for metastatic spread. In addition to an initial PET/CT scan, Dr. Paul Finger also customizes the use of subsequent MRI, CT, and ultrasound surveillance screening for his patients. Unfortunately, many patients around only have access to the most basic metastatic screening. Many health services can only provide ultrasound screening. In some countries, there is no screening at all. The American College of Radiology ranks both abdominal contrast enhanced MRI and CT as methods superior to ultrasound for detecting metastasis to the liver. Sadly, health care systems must weigh systemic costs against individual patient care. In contrast, patients just want the best diagnostic technologies and treatments available. At the New York Eye Cancer, patient-centered care means each individual patient’s needs come first. It’s all about excellence. Pioneered by Dr. Finger at The New York Eye Cancer Center, ophthalmic total body 18 FDG PET/CT imaging combines two technologies to create a comprehensive screening process. In simple terms, CT imaging reveals the body’s anatomy (form). Positron emission tomography (PET) uses an acceptable amount of a radioactive sugar to reveal where tissues are active (function). A complex computer program puts the form and function images together to create a complete, anatomic, and metabolic 3D reconstruction of the patients body. PET/CT allows doctors to measure tumor size and shape, show its location and effect on normal anatomic structures, as well as its metabolically activity. By overlapping the metabolic and anatomic images, for the first time PET/CT puts form and function on the same diagnostic page. While the liver is the most common place for choroidal melanoma metastasis, a study group led by Dr. Finger found that metastases can be found outside the liver (primarily bone and skin). Ultrasound screening focuses only on the liver misses these types of metastasis. There are many factors that indicate increased risk for metastasis in choroidal melanoma patients. Based on these risk factors, individualized diagnosis, and the patients needs, Dr. Finger determines how to approach metastatic screening for each of his patients. Once the plan is in place, he has the best tools in the world at his disposal. Saturday Feb. 4 marks World Cancer Day. Cancer affects people in different ways, but everybody – together and as individuals – can take action to reduce the global burden of cancer. The ‘We can. I can.’ campaign reinforces positive and action-oriented messaging about cancer. It also encourages the engagement of organizations and individuals in raising awareness and taking action against the disease. On World Cancer Day, The Eye Cancer Foundation will join with groups and individuals around the world committed to fighting the scourge of cancer. World Cancer Day is an important event to spread the word and raise cancer awareness around the globe. But more importantly, it’s a springboard for action. In the coming year, The ECF will continue pushing forward with important projects related to diagnosing, treating, and ultimately curing eye cancer. Retinoblastoma is a life and vision-threatening eye cancer that afflicts 10,000 young children every year. Our 2020 Campaign has committed to strategically train and place eye cancer specialists in underserved regions around the world. Our immediate goal is to save 1,000 young lives by the year 2020, but with the help of our generous donors, the sky is the limit. This year, The ECF will host the Second Working Day on the first day of the International Society of Ocular Oncology meeting March 24 in Sydney, Australia. The Working Day will bring together eye cancer specialists from around the world to continue work on multicenter, international collaboration in ocular oncology. At The ECF, we are proud to do our part in the broader battle against cancer, and to join together with others around the world to celebrate World Cancer Day. We can. I can make a difference in the fight against cancer. Early diagnosis is one of the keys to successful treatment of eye cancer. The New York Eye Cancer Center has some of the most advanced diagnostic tools and techniques available. These include high frequency and hi-resolution ultrasound imaging for tumors on, in, and behind the eye. We use high definition digital photography, and OCT imaging. In December 2015, NYECC became the first clinic in the United States to use the state-of-art OCT2 imaging machine in a clinical setting. But all the technology in the world won’t help if patients never come in for an examination. Eyelid, conjunctival, and corneal tumors are the easiest for patients to recognize. However intraocular and orbital tumors behind the eye are more difficult. Most patients with choroidal melanoma have no symptoms at all. These tumors are found by routine eye examinations, which highlight the need for everyone to periodically see their general ophthalmologist. When symptoms do occur, it is crucial to know the signs and symptoms of eye cancers. Squiggly lines, or floating objects. Dark spot(s) on the iris. Dark areas on the conjunctiva – the white of the eye. Bulging or swelling of the eye or eyelid. Pain in or around the eye. Changes in the shape or size of the pupil. Excessive tearing or blood in the tears. In children, a white spot can appear in the pupil known as“leukocoria.” This is best seen when light shines into the eye and is a common sign of retinoblastoma. This often shows up in flash photography. Of course, these symptoms don’t necessarily mean you have eye cancer, but if you notice any of them, you should visit your eye doctor as soon as possible. Remember that eye cancer often develops with no symptoms at all. This is why annual eye exams are crucial. By knowing the signs and symptoms, getting regular eye exams, and acting quickly if any abnormalities appear, you can drastically increase your chances of catching eye cancer in its early stages. 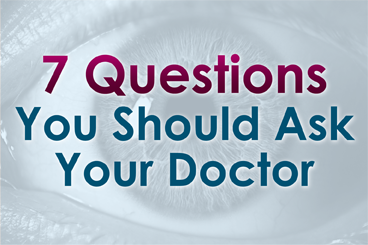 Early, accurate diagnosis and prompt treatment can save both your vision and your life.